When relying on network alerts, by the time the information about fraud or a breach is realized, the amount of fraud loss and compromised card fraud can reach high levels. That’s where the power of fraud analytics, big data and machine learning comes into the mix. Sherwood concluded that credit unions should consider how understanding algorithms (and knowing what to do with that data) can bring about better results. Without proactive tools to mitigate the risks associated with data breaches, this is the result. Proactively mitigating risk is a no-brainer for any credit union leader, but there are a few key issues that often prevent CUs from adequately solving this problem. Fraud and fraud patterns are evolving and change more rapidly than financial institutions can keep pace with. That’s where better data analytics tools bridge the gap by helping banks and credit unions detect breaches faster, and at their source. This is where the value of machine learning and data analytics comes into the mix. “The very nature of Machine Learning is to learn from the data it is processing, adapting to changing trends or relationships in the data,” Sherwood noted in the webinar. Detecting and mitigating fraud to manage risk involves in-depth data analysis to identify relationships and trends to pinpoint where and when the fraud originated. This includes Common Point of Purchase (CPP) analysis." As Sherwood noted in the webinar, relationships and trends are becoming leading indicators of outcomes (like fraud). As these leading indicators emerge in new data, outcomes can be predicted and acted upon. That’s where Rippleshot’s approach addresses credit union’s pain points. A data analytics approach equips issuers with the tools to understand what’s happening across their own card portfolio — and how to detect risk. But you have to have access to that data and be able to make sense of it all. 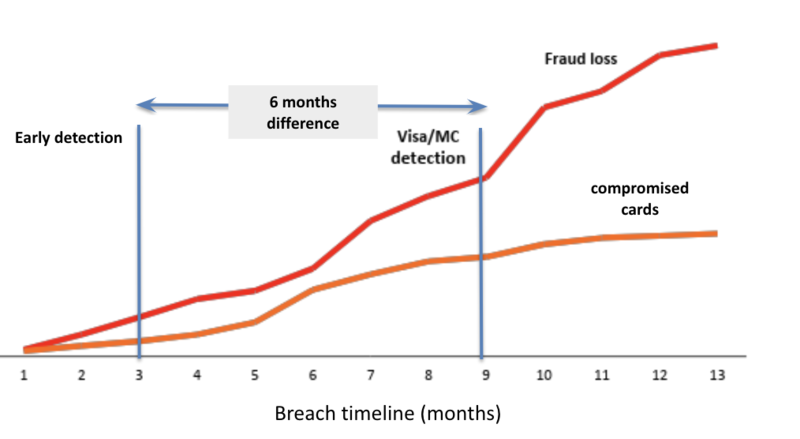 Early breach detection can stop 60% of fraud losses while reissuing less compromised cards. By using machine learning and big data analysis tools, credit union leaders can be better equipped to understand these relationships and trends as leading indicators of certain outcomes. As these leading indicators emerge in new data. Rippleshot, for example, is able to use old data to ID these relationships and trends, and applies those learnings to new data to start to predict certain outcomes and act on what the data is telling us is likely to happen. Rippleshot also has the right industry partnerships to help credit unions to get ahead of breaches faster. We leverage machine learning and combined data from our network of banks, credit unions, and processors. That allows us to monitor roughly 8.7 trillion transactions annually. Our solution detects compromised merchants and identifies at-risk cards. It also indicates the chance that specific card will actually go fraudulent. We’ll tell you (personally) where fraud is starting to emerge, how bad it’s going to be and the number of cards likely to be breached. Fraud and fraud patterns are evolving and change more rapidly than financial institutions can keep pace with. That’s where better data analytics tools bridge the gap by helping credit unions detect breaches faster, and at their source. Sophisticated tech and big data is driving the change you’re seeing across the financial services market, but the real differentiator in any solution is the people powering that platform. Get to know our team and you’ll understand why that really matters. Want to learn more about how Rippleshot can help your team proactively mitigate risk, reduce your card fraud losses and enhance your customer experience? Click here to get a demo inside Rippleshot's technology today.